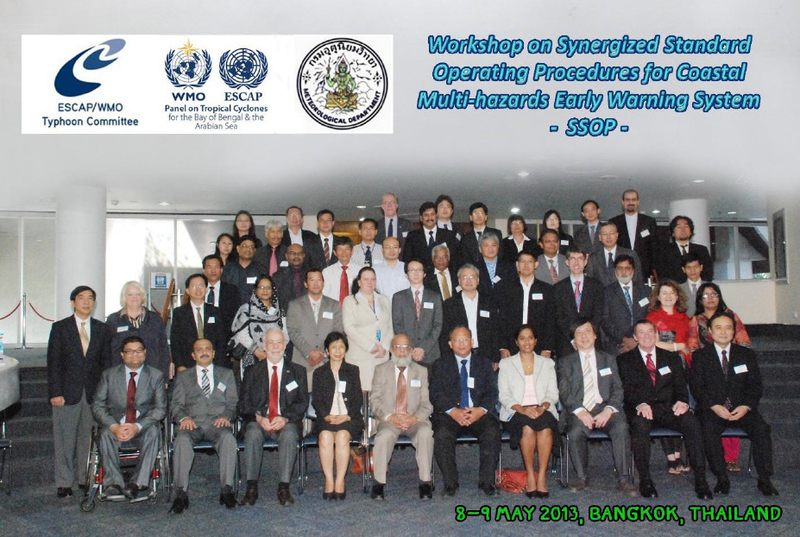 The Economic and Social Commission of Asia and Pacific (ESCAP) approved a submitted project Synergized Standard Operating Procedures (SSOP) for Coastal Multi-Hazards Early Warning System in 2012 and funded it through the ESCAP Multi-Donor Trust Fund for Tsunami, Disaster and Climate Preparedness in Indian Ocean and South East Asia. ESCAP/World Meteorological Organization (WMO) Typhoon Committee (TC) and the WMO/ESCAP Panel on Tropical Cyclones (PTC) in cooperation with other agencies had recognized a strong need to create synergies in early warning systems among different types of coastal hazards by reviewing existing Standard Operating Procedures (SOPs). The main objectives of the project of SSOP were supposed to empower: (1) the capacity building for warning providers as the first priority of the proposed project, mainly focusing on the aspect of hydro-meteorological service for multi-coastal hazards early warning, including the methodology and skills, data and experience sharing, etc; (2) the government officials who would be handling various coastal hazard forecasts and warnings and disaster managers at the national level; (3) the media who would be disseminating such information to the public; (4) the local disaster managers who would issue evacuation orders; and (5) the community leaders and dwellers, including fishermen, in coastal areas of southern Asia, specifically for those countries belonging to the Panel on Tropical Cyclones and Typhoon Committee. The project was terminated in May 2015 with two main outputs including (1) Manual and its Quick Reference Guide on Synergized Standard Operating Procedures (SSOP), and (2) Regular communication and cooperation mechanism between TC and PTC. The successful SSOP project is regarded as an excellent example on the cooperation on promoting the capacity building of multi-hazards early warning among two regional bodies. However, due to the limitation of budget and time, TC and PTC could not extend the results and achievements of the project to all their Members deeply and widely. Therefore, it was suggested very strongly at the 3rd joint Session of TC and PTC (TC 47th Session and PTC 42nd Session) to request the Members, after the Manual is complete, to consider ways to make the best use of it, and to develop a proposal for SSOP Phase II (SSOP-II), based on the successful completion SSOP-I project, and submit to ESCAP for funding consideration. The SSOP-II II was proposed to be mainly focused on the training on how to establish an appropriate standard operating procedure (SOP) based on the published SSOP Manual and on promoting the TC and PTC Members’ capacity building on Multi-hazards Risk early waning based on existing technical achievement for National Meteorological and Hydrological Services (NMHSs) in proposed beneficiary countries. SSOP-II will be terminated in October 2018.